"A climb of Mt. Shasta is a very special experience. It presents each individual with the unique opportunity to visit the Mt. Shasta Wilderness, part of the National Wilderness Preservation System...We encourage you to enter into the spirit of wilderness and humbly and carefully make your way through this landscape, ever mindful of the special privilege you have to realize yourself as a creature in harmony with wildness, pursuing the challenge and reward of personal growth. On your journey to the summit, travel lightly and quietly on the land. Experience the timelessness of rock and ice, the dormant volcanic energy of a sleeping giant, and the indifference of eternity. Come prepared to climb a major mountain." Dogs are NOT allowed anywhere in the Mt Shasta Wilderness OR on Sierra Club Property. Please respect this rule and know where the boundaries are. The Old Ski Bowl is a great place to take your dog that is outside the wilderness with plenty of room to ski, play, snowmobile, etc. Sun Bowl and Powder Bowl are part of Sierra Club property and dogs are NOT allowed in those areas either. There is a map posted at all trail heads to help educate oneself of the boundaries. Expect to receive a citation if caught! Let us take a quick side trip: A FAQ... WHY are dogs not allowed in the Mt Shasta Wilderness? There are several reasons. Many animals in the Mt Shasta Wilderness and surrounding area react to the scent of a canine, reading only: predator. Although your dog may be friendly, many of the animals that live in a habitat will avoid areas where a predator scent has been left. This means they may not be able to search for food or find safety in their usual places. In addition, many diseases may be spread either to your dog from wildlife or vice versa. Some of these diseases, like plague and Lyme disease, are dangerous to humans as well. The high elevation mountain environment also poses some special problems for dogs. Steep, icy and rocky slopes offer plenty of potential for your dog to slip and take a tumble. Further, blazing sun can lead to snow blindness and burned pads on the bottom of your dogs feet. This will ruin his/her visit into the Mt Shasta Wilderness. There are even more reasons why we don't allow dogs: ...Canine distemper, which still occurs, is spreading to many populations of fox, fisher, bobcat, etc. It poses a serious threat to some native populations, especially fox... A referenced study by the Smithsonian Conservation Biology Institute states that cats kill between 1.4 and 3.7 million birds every year and 6.9 to 20.7 million mammals every year. It goes on to say that dogs are worse because they chase birds and mammals, disrupt nesting sites, kill them outright, or disrupt migration patterns....and finally, not to mention the dog on dog and dog pestering human problems we're all aware of... SO, not only is it illegal to take your dog into the Mt Shasta Wilderness, it is dangerous and your dog would probably rather be at home. We hope this helps you understand a bit more why we don't allow dogs in the MS Wilderness. Moving on...Wilderness Permits are required to enter the wilderness. They are free and available at all OPEN trail heads or at the Mt. 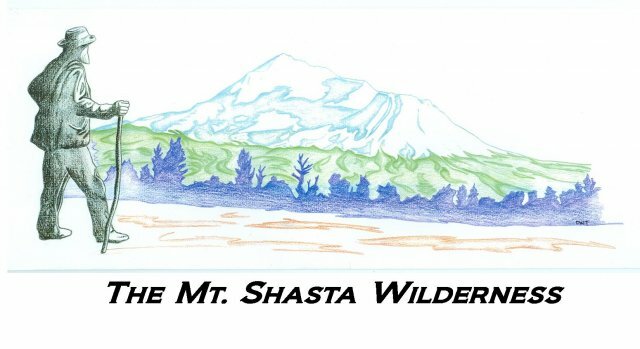 Shasta and McCloud Ranger Stations and at The 5th Season in Mt. Shasta. A summit pass is required to go anywhere above 10,000 feet, even if you do not plan on going to the summit. They are $25 for a 3-day pass or $30 for an annual and available for self issue at all OPEN trail heads, The 5th Season or at the ranger stations (Mt. Shasta/McCloud). The annual pass is only available at the ranger stations or The Fifth Season during business hours. When you are climbing or skiing, have your summit pass and wilderness permit ready to show a ranger. If it's in the bottom of your pack, while we'd love to trust you, the rangers will have you dig it out....no fun when you're in your skiing/hiking groove so just stick it in your pocket! Thank you so much for obeying these simple rules and enjoy your Mt. Shasta Wilderness experience!! If you have any questions, don't hesitate to call the Mt. Shasta Ranger Station front desk at 530-926-4511 or The Climbing Rangers at 530-926-9614. ♦Wilderness Permit, Summit Pass, and Human Waste Pack-out Bags: you can get all of these for self-issue at all the trail heads or at the Mt. Shasta Ranger Station 24/7. The Mt. Shasta Ranger Station is now open Monday through Saturday from 8-4:30pm. Annual summit passes are available for $30 (good Jan. 1 – Dec. 31) at the Mt. Shasta and McCloud Ranger Stations during business hours and at the Fifth Season in Mt. Shasta and REI Sacramento. Regular summit passes (3-days, $25) are available by self-issue at all open trail heads, Mt. Shasta Ranger station 24/7, and during business hours at The Fifth Season, Shasta Base Camp or at various REI stores in the Bay Area and Sacramento. Reservations are not required. OVERALL CONDITIONS: The Mount Shasta climbing season is in full swing, and it is the right time to climb! The small amounts of new snow over the last week prior to Memorial day weekend have smoothed out the snow surface above 9,000 feet making for great climbing and skiing conditions. The weather outlook for the remiander of the weekend and Memorial Day looks like typical late spring weather. For Sunday, expect sunshine with some afternoon clouds. Winds will be light 5-15 mph out of the north-northwest. On Monday (Memorial Day) the day will start with a few scattered clouds with increasing clouds and a slight chance of afternoon thunderstorms. Chance of precipitation is 40%. Winds will be light, 5-15 mph shifting to the southwest. The rest of the work week will be partly cloudy with slight chances of afternoon thunderstorms. Winds could be gusty under thunder cells. Keep an eye to the sky and descend if clouds begin to build on the mountain's summit or vicinity. Always check the weather before your climb and never climb into a white out as many climbers have become lost in similar conditions. Climbers should expect firm snow in the morning with things beginning to soften up around noon for glissading. This will mean, however, that "slide for life" potential exists and a long tumble is possible if one is unable to self-arrest in the event of a fall. Everyone should have crampons, mountain axe, and a climbing helmet, and know how to use them! The general Spring avalanche statement has been posted on the avalanche advisory page. The winter season avalanche forecasts will resume in December. The potential for avalanche conditions will persist through the Spring, especially with storm activity and new snow accumulations. Avalanche activity will be most likely during and immediately after storms. The avalanche problems during Spring will be new storm snow, wind slabs, wet slabs, and loose wet snow. Ice fall and rock fall are possible, as well. Wear a helmet and keep your eyes up slope as you climb. Check the WEATHER FORECAST before coming up onto Mt Shasta! Always check the weather before venturing onto Mt Shasta. Definitely keep an eye to the sky as you climb, turning around if clouds begin to build on or near the mountain. PLEASE make sure to be prepared. ALWAYS WEAR A HELMET and KNOW HOW TO USE YOUR ICE AXE & CRAMPONS! The bottom line: BE PREPARED for full mountain conditions at any time. Wilderness Permits, Summit Passes, and Pack-out Bags are currently available at Bunny Flat and Mt Shasta and McCloud Ranger Stations. The bathrooms are now OPEN at Horse Camp, and the spring water IS RUNNING and available. For all routes on the mountain one must melt snow for water, so bring extra fuel. We recommend that you DO NOT climb into deteriorating weather as many climbers have become lost, injured or died in poor weather. ALWAYS check the weather and Avalanche Advisory before you hike or climb. Have a safe and enjoyable climbing season! At a height of 14,179 ft. Mount Shasta is a high altitude peak, and it is common for climbers to experience acute mountain sickness (AMS) with signs and symptoms of nausea, headache, and lightheadedness. Despite being a common condition, AMS should not be taken lightly. It can quickly develop into the much more serious, and potentially deadly pulmonary or cerebral edema. Stop, take a break, and if symptoms do not improve, descend, descend, descend! SELF RESCUE IS HIGHLY RECOMMENDED should one become injured or sick. Avalanche Gulch– John Muir Route (Regular Route) via Bunny Flat Trailhead: This route is currently in great shape for climbing with good coverage. The summer trail to Horse Camp is now open and exposed dirt until just before Horse Camp. Where the trail is still snow covered follow the red flagged wands that mark its path. The snow is firm and supportable at, and above treeline. Skiing/riding on this route is decent right now with the few inches of new snow that have helped to smooth out the snow's surface. In the early morning hours the refrozen snow surface will be firm and smooth. While great for climbing these conditions present "slide for life" potential if one is to slip and fall and unable to self-arrest. That being said there has been a good boot pack leading up climber's gully to Helen Lake, and continuing up the headwall portion through the right chute at the Red Banks. Please do not down climb through an uphill track. Crampons and a mountain axe are necessary equipment, and you should know how to use them! Also, PLEASE, wear a helmet and limit your exposure to rock and ice fall by moving laterally out of the fall line as you climb. Always keep an eye above for rock fall, and yell "ROCK!" if you see one to warn other climbers below you. The best route through Red Banks is up and through any of the snow filled gullies/chimneys located just right of the center of the Red Banks. The right most chute is the best option currently. Climbing toward The Thumb and around the far right end of the Red Banks is an early season, and longer variation that exposes one to the partially snow bridged bergschrund at the top of the Konwakiton Glacier. This route is NOT recommended. The bergschrund has started to gape open along parts of its length. The snow bridged portions will only get weaker and become soft in the afternoon. Don't fall through here... simply take the other route mentioned. DO NOT glissade through the Red Banks...keep your crampons on, down climb through this area and then assess the glissading conditions below. Make sure the snow is SOFT, take off your crampons, and use your mountain axe to control your speed! Expect winter camping conditions as Helen Lake is entirely snow covered, so bring a shovel! PLEASE keep a clean camp...PACK OUT ALL micro trash, food scraps, coffee grounds, leftover pasta, you name it...please pack it out...Rangers take this VERY SERIOUSLY and so should you! Thousands of climbers camp here annually and it takes each of us to keep it clean. If you love what the mountains give you, then show them respect by packing out EVERYTHING and LEAVE NO TRACE. Keep it looking pristine for those that will visit after you, and for the preservation of WILDERNESS! Secure your tent and belongings well when you leave for the summit. Wind, ravens and the resident pine marten will spread your gear far and wide if it is left unsecured. If your stuff is zipped up and stowed away well within your tent, you shouldn't have a problem. We have not had any issues with critters chewing through tents to get into stored food. SANITATION: Please urinate on the far EAST side of Lake Helen, AWAY from all camps. Use your pack-out bag over in this area as well. DO NOT urinate in the general camping area! Snow must be melted for water and we recommend treating it one of three ways: iodine, boil, or filter. Water is now RUNNING at the spring at Horse Camp! For all routes on the mountain one must melt snow for water at the high camps, so bring extra fuel. The toilets are now OPEN at Horse Camp! Pack-out bags are mandatory for removing all solid human waste on the mountain. Pack-out bags are available at Bunny Flat. Carry the "Ten Essentials." Learn more about mountaineering knowledge and skills by reading "Freedom of the Hills" (published by The Mountaineers), practicing before your climb, and/or by taking a snow school class. Three guide outfitters in the area offer classes and guided trips on Mt. Shasta. Links to their web sites are available on our web page. Casaval Ridge, Green Butte/Sargents Ridge via Bunny Flat Trailhead: Casaval Ridge is in OK shape currently. Snow coverage along the ridge top below 10,500 feet has started to thin out a bit. While not technically difficult, Casaval Ridge presents its difficulty by providing exposure to long fall potentail along much of the upper ridge line. The catwalk is still in doable shape being mostly snow/ice covered. There are a couple of bare patches of exposed rock along its length. If one chooses, it can be avoided by traversing climbers left, finishing at the top of the West Face route. Green Butte/Sargents is in OK shape. The upper portion of Sargents Ridge has a lot of exposure along the ridge top. The "sawtooth" portion of Sargents is the crux of the climb and sneaking through the cliff bands can be hazardous in the form of exposure to long falls. Overall conditions on both these routes are good, however it is recommended that one has strong self-arrest, route finding and mountaineering skills! Be careful not to dislodge rocks onto the Avalanche Gulch climbers below you! Once again, both of these routes have a lot of exposure for long falls, and are better off for more experienced climbers. Please call the Mt. Shasta Ranger Station for more details. Cascade Gulch, Shastina and West Face via Bunny Flat Trailhead: Although many books list the Cascade route as easy, it also hosts patches of ice and a bit of exposure to crevasses where it crosses the upper Whitney glacier, even when minimized to approximately ¼ mile. Glacier travel training is recommended. Shastina is in good shape and snow coverage is good. Approach from Hidden Valley/Cascade Gulch. The West Face is in good shape for both climbing and skiing. Water is only available in the form of melting snow. The approach to Hidden Valley from Horse Camp is still covered in snow albeit a few patches of rock/dirt. This traverse can get very soft in the afternoon hours and while snow shoes are helpful, the off camber nature of the terrain makes it tricky. Skis are best. Sand Flat Trailhead: OPEN. One can now drive the entire Sand Flat Loop Rd. and the access road to the Sand Flat TH. Summit passes, wilderness permits, and pack-out bags now available. Please deposit used human waste pack-out bags at Bunny Flat TH human waste bins. Thank you. The routes on the north and east sides are not for novices! Watch for weak snow bridges over the crevasses, especially this time of year when annual snow pack is low and on warm days! Come by Ranger Stations for the latest information and permits, passes and pack-out bags. Northgate Trailhead: OPEN FOR SEASON! - We have a lack of current, first-hand information on this route at this time. Viewed from afar, one can expect the full range of snow conditions. Standard glacial travel protocol is a must if venturing onto the glaciers. All crevasses should be covered, but weak snow bridges are likely due to windy conditions that may have scoured snow. Self-arrest skills are a must and may be difficult even for the expert when icy conditions are encountered. One can now drive all the way to the North Gate trail head! Be advised that the road is rough, but is accessible by 2-wheel drive vehicles. The bathrooms are open, summit passes and wilderness permits are available for self-issue, and pack-out bags are available! Call for more details, or give us an update of conditions if you head over to this aspect of the mountain. Take pictures! Brewer Creek Trailhead: OPEN FOR SEASON! - Summit Passes, Wilderness Permits, and Pack-Out Bags are available, and the bathroom is open! This trail head is the best access point for the Hotlum Glacier and the Hotlum/Wintun snowfield, which is a popular ski descent. You can now drive all the way to the trail head parking, bathroom, and kiosk. One must hike close to a half of a mile before continuous snow making ski touring possible. Route conditions have transformed into a consolidated, firm snow pack. Snow conditions for skiing are excellent on this side of the mountain with a smooth surface. Overall conditions for the Hotlum/Wintun Ridge route are good. Always be on the watch for rock fall, especially as you traverse above the Wintun and ascend the summit chute. Be mindful when returning to your car as many people become confused and disoriented upon descending below tree line. The most common mistake is to miss the trailhead too far to the south. Pay attention! Wilderness permits and summit passes are available at the Mt Shasta Ranger Station, and NOT available at the trailhead yet. If driving from Susanville, you must come to McCloud or Mt Shasta ranger stations to pick up your summit pass/wilderness permit. Pack-out bags are available in the un-locked bathrooms at the TH's. Clear Creek Trailhead: OPEN FOR SEASON! - Wilderness permits, summit passes, and pack-out bags are now available at the trailhead. This is the easiest (non-technical) ascent of Mount Shasta, granted you stay on route. The trail is free of snow until the trail begins to traverse along the ridge top above Mud Creek Canyon (approx. 2 miles up). This route has decent snow coverage above tree line, however ski conditions are poor. From afar, the route looks dirty...that is dust blown onto the snow from Mud Cr. Canyon. The road that accesses the trail head is free of snow and down trees, and a 2-wheel drive vehicle can make it just fine. The traverse above the Wintun Glacier to the Summit Plateau will present the "crux" of the climb and the steepest portion of the route. Rock fall has been encountered by some in this area also. While the easiest route on the mountain, don't let your guard down and still carry proper mountain equipment. This route has been the scene of many rescues due to "casual day syndrome"! Thus, the Clear Creek route should not be taken lightly; if one were to find themselves off route, glaciers/rock fall and other hazards can be found. A helmet, ice axe and crampons are still recommended for this route. Horse Camp: The Horse Camp cabin and the surrounding property are owned and managed by the Sierra Club Foundation. The composting toilets are now OPEN for the season, and the spring for water is accessible and RUNNING as well. The cabin is open year round and all are welcome, however one cannot sleep inside the cabin except in emergencies! Make sure you close the door when you leave...If you plan on camping at Horse Camp, please make sure to pitch your tent on either an existing tent site or on snow. Please DO NOT camp anywhere where snow has melted, near tree wells, or where a tent site is not obvious. Thanks! Lastly, the Sierra Club Foundation manages their property under the Mt Shasta Wilderness rules - so you cannot bring dogs on Sierra Club property either. PLEASE RESPECT THE RULES... THANK YOU! ALWAYS check the weather before you hike or climb. Have a safe and enjoyable visit. If you would like more information, feel free to come by the Mt. Shasta Ranger Station for slide shows, pictures, or to speak with a ranger and/or our very helpful front desk Staff. Tips: Climb early and descend early! This limits exposure to inclement weather (afternoon thunderstorm buildups are common) and allows plenty of time to descend before dark. Avalanche training along with a transceiver, shovel and probe are recommended in winter and spring! Get an alpine start (2-5am) and have an early turn around time around 12 to 1 pm. Proper equipment, clothing and training are a must. Helmets are recommended and expect rock or ice fall at all times. Mt. Shasta is a 14,000 ft. lightning rod and is frequently hit by lightning (usually in summer and fall months), so don’t push your luck with building thunderheads. Do not expect to be rescued. Rather, prevent rescues from happening in the first place, and be prepared to handle rescues within your own climbing party should something happen. Nature sets its' own terms and YOU must judge how much risk you are willing to accept. Extra warm gear, like a down jacket, baclave and extra gloves are a good idea in winter, spring and fall as climbers often develop superficial frost bite during strong winds. Anchor your tent well wherever you camp! Tents can and do blow away frequently. Do not plan to camp above tree line if you do not have anchor lines for your tent! The wind chill temperature near the summit in winter and spring can be well below zero. Best time to climb: The best time to climb Mt. Shasta is generally from late May to mid July on the SW side of the mountain when summer days are longer and the weather is generally stable. However, in dry years (2007/2008), the thin snow pack creates the best climbing conditions in April, May and early June. When the snow melts away, you are left with 7000 feet of scree, talus and boulders. In heavy snow years the climbing season extends to August or September. There is NO trail to the summit. Climbing is much more safe and fun on consolidated snow! The routes on the north and east sides are not recommended for un-guided novices; glacier travel and route finding skills are prerequisites. Spring and summer can bring the chance of thunderstorms. THE TEN ESSENTIALS-Keep you and your party out of search and rescue statistics by using common sense and carrying the following: map, compass, sunglasses/sunscreen, extra food and water, extra clothing, head lamp/flashlight, first aid kit, matches/lighter, stove, knife and a bivy sack. If you choose to climb: Solo climbing is not recommended! Traveling with an experienced group is a good idea, and remember - do not split up the group! Wear a helmet, use common sense and carry the ten essentials. The mountain has extreme weather changes. Therefore, it is a good idea to set-up a turn around time for your party. A note on wind... Mount Shasta stands by itself in the atmosphere. There is nothing anywhere near its' height for over a hundred miles. Because of that, Mt. Shasta creates a lot of unique wind conditions. Especially during the winter, spring and early summer, the snow covered mountain provides very little friction for accelerating winds bending around and over this topographic anomaly. Winds over 100 mph at tree line (8000 ft.) are common. It's anyone's guess what the winds at 14,000 ft. could be when instruments measure 150 mph winds 6000 ft. lower down on the mountain. Winds of 40 mph can knock you off balance. Winds of 60-70 mph can force you to crawl (and cry!). Hurricane strength winds (>74 mph) can make it nearly impossible to stand and destroy well anchored tents. The strongest winds occur with big pressure and temperature gradients in the atmosphere, and tend to occur in front of, and behind, storms. The lowest winds occur when the center of a high pressure is over the Mt. Shasta area. Take this seriously as wind has resulted in searches, injuries and fatalities.